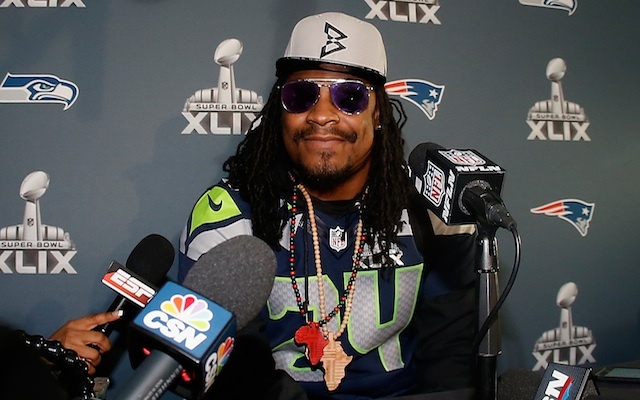 I have a confession to make: I kind of love Marshawn Lynch. For some of you this is no big deal, for others–the 49ers fans of my friends and family–this is a huge deal, even a deal breaker. Lynch is on the biggest rival of my precious 49ers–the Seattle Seahawks. Not only that, but he is a sort of 49ers killer, seemingly unstoppable even with the 49ers’ top tier defense. Now in the world of 49er fandom it’s not entirely unacceptable to like Seahawks’ players. Russell Wilson is an acceptable choice, his humble demeanor and religious beliefs do a lot for him, making him a likable figure. But Lynch is a somewhat cocky and brazen figure, not quite on the level of Richard Sherman, but close. Yet I can’t help but admire the performance he has put on for the media this week. He has been known previously to dislike talking to the media (read Dashiell Bennet’s piece if you want an outline of his history and Bennett’s opinion on why it’s okay ) but this week he really went for it. Lynch completely trolled them, only showing up so that he wouldn’t get fined (as he repeatedly stated) and then left after his minimum time had been reached. I love this for a couple of reasons. The first reason is it is almost a form of civil disobedience. Lynch doesn’t want to be put into this situation–we can debate whether he is right for not wanting to–so he responds to it in a way that sheds light on how stupid the situation is. He could show up and regretfully answer questions or he could skip the whole thing and get fined, instead he shows up and holds a mirror to the parade, showing us all how ridiculous we look. Now I like the spectacle of the Super Bowl, it’s a fun event that at this point is probably the seventh largest holiday that America celebrates (1. Christmas 2. Thanksgiving 3. Easter 4. New Year’s Eve 5. Fourth of July 6. Valentine’s Day). Without the large media coverage, it probably would not be as fun of a day, so I’m accepting of the situation. But one thing I hate–which leads into the second reason I love what Lynch is doing–is the sports media. Think about the kind of coverage we get from them, Michele Tafoya’s interview with coaches headed to the locker room–“Well, we’re trying our best and hopefully we’ll score more and be able to win”–OH REALLY!?! The coaches and players almost certainly don’t want to talk to media during the game and probably aren’t thrilled to talk to them after. The information we receive from them usually isn’t anything important, because they are not going to give us their actual, real game plan, and so we are left with some sort of pre-scripted statement that essentially means nothing. Pre- and post-game coverage wastes everyone’s time, well, except for maybe Michele Tafoya’s! Yet players are forced to participate in this even while they must maintain league standards for what they say and how they present themselves. You must be subject to this interview and you must wear our brand and you must not say anything controversial or WE WILL FINE YOU. Civil disobedience may actually be necessary. Lynch’s actions will certainly impact how other players behave in interviews just like it will impact the NFL’s policies. The NFL will try to stop this, likely with larger and stricter fines, but perhaps by loosening the types of forced interviews. Players will continue to figure out ways to undermine the NFL’s efforts at controlling acceptable behaviors. But my question is about what happens to the media–how will they evolve and adapt? They are–for me–an insufficient and uninteresting part of sports, but there is potential there. Longer forms of sports journalism can bring insights into the minds of athletes, coaching decisions, and other larger sociological parts of sports. The media either needs to put more effort into getting grander results in the moment or needs to figure out better questions to ask to get better results. “What was going through your mind when you made that play?” and “How are you going to approach [insert athlete name] tomorrow?” aren’t going to cut it. We live in the age of Marshawn Lynch and until somebody does figure this out, let’s celebrate Lynch and his Skittles.